Since “Amarillo” is the Spanish word for yellow, and “Ají” is the term for chile in South America, this pepper is also appropriately known as the “yellow chile.” The Ají Amarillo is grown in all areas of Peru. Used by the Incas, it is still the most common and popular chili pepper in that country. It may be said that is it possibly the most important ingredient in Peruvian cuisine, as it is incorporated in a number of national dishes. You’ll find them at Peruvian markets in many forms, including fresh but also dried, canned or chili paste. Aji Amarillo chili paste is very common and used in many recipes as well, including the famous and wonderful Aji Amarillo sauce, which is a national favorite. What Does the Aji Amarillo Look Like? 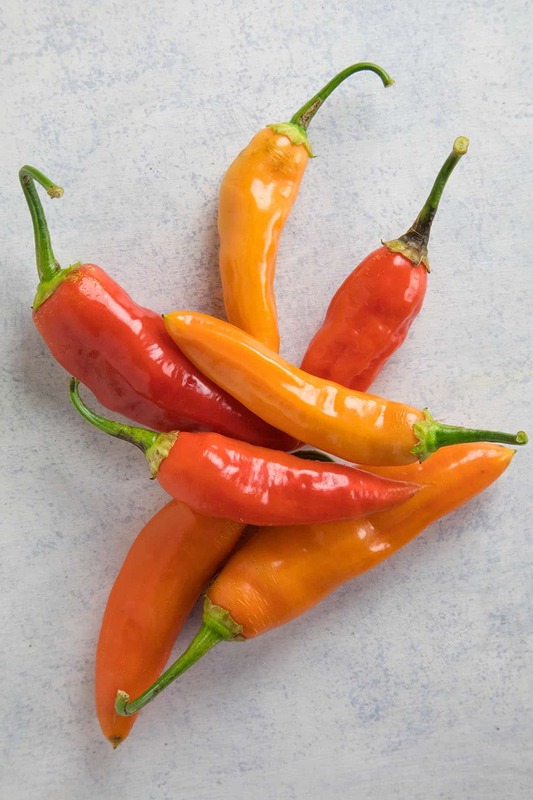 The Aji Amarillo pepper grows to about 4-5 inches in length, and despite its name, it actually matures to a deep orange. The skins are vibrant and smooth, though slightly ripply. The color can vary from pod to pod as they mature, from a bright orange to deep, deep orange. What Does the Aji Amarillo Taste Like? Like other peppers from this area, the Aji Amarillo has a fruity, berry-like flavor. It is medium in heat level, but it does not leave your mouth burning. It is also great as a condiment. I find the flavor to be quite vibrant, which makes them great for making sauces, salsas, or drying and grinding into powders. It’s definitely a must for Peruvian food. How Hot is the Aji Amarillo? On the Scoville Scale, the Aji Amarillo ranges from 30,000 – 50,000 Scoville Heat Units (SHU), which is about as hot as a serrano pepper. Compare this to a typical jalapeno pepper, it can be up to 10 times hotter. What Can I Substitute for Aji Amarillo? If you’re unable to find these peppers or cannot grow them, you can usually substitute them for the more commonly found habanero pepper or Scotch Bonnet pepper. Beware, however, as both of those peppers are quite a bit hotter than the aji. They’re similar in flavor profile, though, and have a nice fruitiness. If you’d like to tame the heat of those substitutes, core them out to remove the innards, which is where most of the heat resides. The Ají Amarillo may be sold in Latin food stores and on the internet in its dried or paste form. Check out all of our Chili Pepper Types. Got any questions? Ask away! Leave a comment or shoot me an email. — Mike H.